The Trudeau-appointed senator who chairs the Red Chamber's powerful internal economy committee is asking his fellow senators to amend the rules to make it easier for the body to meet in secret more often — away from public view — raising concerns among some about the upper house's professed commitment to openness and transparency. The Trudeau-appointed senator who chairs the Red Chamber's powerful internal economy committee is asking his fellow senators to amend the rules to make it easier for the body to meet in secret — raising concerns about the Senate's professed commitment to openness and transparency after a period of scandal. 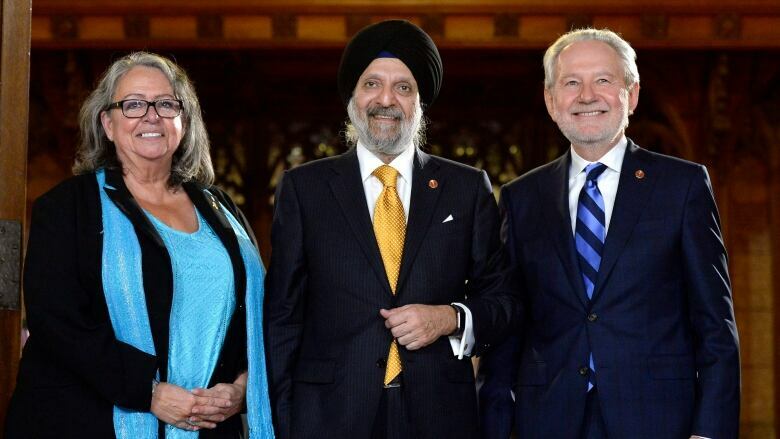 Independent Ontario Sen. Sabi Marwah, who assumed the chairmanship of the Senate's internal economy, budgets and administration committee at the end of September, has asked for greater leeway to meet 'in camera,' or behind closed doors, more often than the current rules explicitly allow. This committee adjudicates disputes, sets office budgets and polices the expenses of senators, among its many other responsibilities. Right now, Senate committees meet in camera when discussing topics in four sensitive areas: wages, salaries and other benefits; contracts and contract negotiations; labour relations and personnel; and drafting agendas or reports. Under the new changes proposed by Marwah — and endorsed by most of the committee — CIBA, as the committee is known on Parliament Hill, would be able to go 'in camera' whenever it wants. Marwah, an executive at Scotiabank before his appointment to the upper house in Nov. 2016, did not say when and why the committee might close its doors to public view. He said matters of security and litigation were on a "laundry list" of topics the committee could address in secret. "The fact is CIBA does deal with confidential and sensitive issues and we need some flexibility to deal with that," Marwah said Tuesday in making his plea to senators on the chamber's rules committee, the body that will ultimately sign off on any changes. "The rules ... as currently worded are very restrictive as to when committees are authorized to meet in camera." "CIBA is requesting the necessary discretion to meet in camera when required and not (to) be limited by the matter specified in 12-16(1)," Marwah said, citing the section of the Senate rules that dictate when private meetings can or should be held. Actually, any Senate committee can go 'in camera' if a majority of members vote in favour. Marwah is asking for a rule change for greater procedural certainty, said Alison Korn, a spokesperson for committee, in a statement to CBC News. Korn said it's possible a few wayward members could derail a move to go in camera. "A member could challenge going in camera on other sensitive issues, security being the most obvious. There is procedural uncertainty in relation to whether or not the committee is able to go in camera on other issues not listed in the rules," Korn said. "The [rule change] recommendation does not diminish CIBA's commitment to be open, transparent and accountable." Marwah told the rules committee he is not trying to undermine transparency — but he wants a "proper balance" to "conduct certain sensitive and confidential discussions in camera." The open-ended nature of Marwah's proposal prompted other senators — including Liberal Sen. Serge Joyal and Independent Sen. Elaine McCoy — to ask him to make his request more specific regarding when the committee can meet in private. McCoy said openness should be the primary consideration when crafting new committee rules. "I would start with one principle, the biggest principle of all: the public interest ... I think that should be the guiding star," McCoy said Tuesday at the rules committee. "The public interest in 2018, I think, demands much more transparency, much more public transaction of business." McCoy said meeting in camera "leads to mistrust ... the public mistrusts anything done in secret." Independent Quebec Sen. Renee Dupuis, a former member of the internal economy committee, said she wants further study on the matter. "CIBA makes decisions on public resources. People no longer accept that these decisions may be made behind closed doors." Independent Quebec Sen. Pierre Dalphond said he also opposes giving the committee "carte blanche" to go in camera. "This goes against the principle of transparency and public accountability," he said in French. The proposed rule change could lead to a reversal of practices established in the last 10 years. The push for greater openness in the Senate was prompted, in part, by the expenses scandal that left four of its members facing police investigations and — in at least three cases — criminal charges for alleged misspending and impropriety. All those charges were ultimately dismissed. The scandal prompted soul-searching by some members of the upper house as they sought to rebuild public trust. The former Conservative chair, Saskatchewan Sen. David Tkachuk, initially opened CIBA meetings to the public. He allowed the audio of most of its meetings to be broadcast online. After he stepped aside, another Conservative chair of CIBA, Quebec Sen. Leo Housakos — with the support of other members of the committee — allowed for video broadcasts of most of the committee's meetings. The meetings were thus "on camera" by default and "in camera" only when necessary and after some sort of public explanation. Housakos noted the Senate's internal economy committee became the first such committee in the Commonwealth to broadcast its deliberations so widely. "As we go forward ... we should always push back the inclination to try and do things in camera unless absolutely necessary," Housakos said, adding he is opposed to "automatic" in camera meetings. Individual senators have faced public questioning before the committee about their expenses. Independent Manitoba Sen. Marilou McPhedran, for example, appealed two decisions by CIBA to dismiss expense claims and deny her money for international travel. Those discussions became heated as McPhedran accused another member of the committee, Conservative Saskatchewan Sen. Denise Batters, of trying to ruin her reputation by insinuating she has been untruthful about her expenses. Beyond the push for greater committee openness, the Senate also has been deliberating for almost three years now a fundamental rethink of expense oversight to instill greater confidence in the process. While some — like the government's representative in the upper house, Ontario Sen. Peter Harder — have called for outside oversight of expenses, there has been pushback from senators who feel this could threaten the ability of Parliament to govern its own affairs.